This one-story art deco building is one of six such police district stations built by the city in 1936 and 1937. All are in a similar art deco design, employ similar floor plans and fireproof construction and all were designed by Albert Osburg, chief architect of the city’s Board of Public Service. 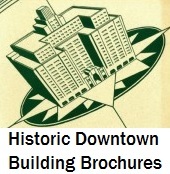 Osburg had already demonstrated his mastery of the art deco style with his design for the Homer G. Phillips Hospital. These distinctive police stations reveal his keen eye for using the streamline nature of the building itself as both form and detail. Sparsely ornamented, the police stations rely on functional parts – signage, handrails on the steps, the shape of the buildings – to express their machine-age sensibility. Osburg also employed the use of varied angles of bricks in courses above doorways and windows, a common stylistic feature in art deco design. He designed three of these buildings to be clad in buff brick, like this Ninth District station, and three in a brick that is almost gray. Unfortunately, the St. Louis Metropolitan Police Department consolidated its nine districts into three “superstations” in the early 1990s, building new and bland postmodern-style station houses. The art deco buildings fell into disrepair, with one (on Hampton Avenue) transferred to new use by the city’s Emergency Medical Services program as an ambulance garage and dispatch center. The others sat empty for years, finding new uses eventually, such as the old Third District Police Station in Soulard that became the home of the Mad Art Gallery in 2000 after nearly twenty years of vacancy. The Ninth District Police Station has yet to find a new use. Street closings and wholesale clearance have devastated its Midtown surroundings and made it a much less attractive candidate for creative reuse than it would have been in a bustling neighborhood. Nowadays, it sits surrounded by drab parking-lot-ringed low-rise apartment buildings, whose ugliness glares against this fine art deco building. The effect may accentuate its stable and modern mass to the architecture buff, but the effect certainly does not encourage anyone thinking of seriously reusing the building. In 2003, the building was populated by two homeless people, a black man and a white woman. They lived inside of the side entrance, a fact that two friends and I discovered by peaking through the broken door and meeting eyes with one of the residents. They were friendly people. The man slept through a lot of the conversation, while the woman asked what we were doing there. They both asked us for cigarettes and marijuana, and allowed my friend to photograph them. Inside, their “living room” was very clean; they had swept up a large area of the building for living space. They let us look around the first room from the doorway, but said they couldn’t let us go any further. “It’s not safe in the rest of the building,” the woman told us. Fortunately for the station, the Washington Metro AME Church, located in one of the few other older buildings on the block across the street from the building, has since purchased the police station for its parking lot. The church has sealed the building, and may renovate it some day.